We founded Rebel Rebel in 2000, because we love flowers and it seemed like a good idea. Since then we have worked hard, learned our craft, learned about flowers, worked even harder, learned more and built up our Rebel team. 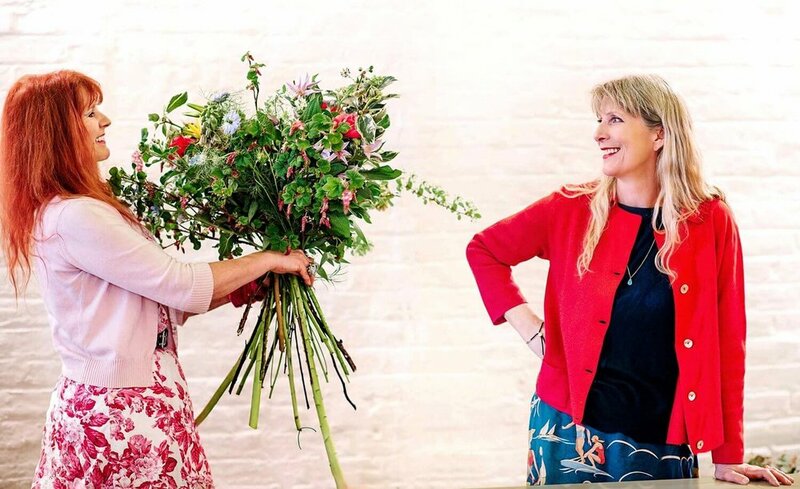 Mairead and Athena founded Rebel Rebel in 2000, because they loved flowers and it seemed like a good idea. With the help of their highly talented team of ambitious, imaginative and flamboyant florists, they have built Rebel Rebel into a successful and award winning business, and become one of London’s premiere florists, designing weddings and creating floral designs for some of the world’s most prestigious clients and brands. We buy flowers and foliage from New Covent Garden flower market every morning. Mostly seasonal, often British, we choose what we personally like and hope that you share our love. Our flower shop is in Mare Street Market, 117 Mare Street (Corner of Westgate Street) London, E8 4RU; open Monday to Friday, 9:30am until 6.30pm, Saturday 9:30am until 5:00pm and Sunday 10.00am until 5.00pm. From our workshop in Regent Studios, Rebel Rebel specialises in flowers for weddings, corporate events, parties, installations and contracts. We also run flower workshops in London and Tuscany and regularly hold courses at the Cohim Flower School in Beijing.